So I was coming into Lekki from VI during rush hour and I was very famished. I’d heard about the N2500 all day buffet served at Breakfast Lunch Dinner (BLD) and thought it’d be a great deal for my pocket and my growling stomach. BLD offers a regular menu but I didn’t really look at that. I came strictly for the buffet. Ambience: I like the ambiance at BLD. The furniture, the wooden floors, and brick walls behind the buffet bar all really make sense. Outdoor seating is available but buffet customers can only sit inside. If you sit outside or on the rooftop, you have to order from the regular menu. Food: The food variety was good with some Chinese and African options; rice, noodles, beans, plantains etc. The bread rolls were hard and probably had been on display for a while. The salad bar had a selection of lettuce, cabbage, carrots, and sweet corn. They also provided diced apples, watermelons and pineapples for fruit salad. The available dressings were thousand island (my favorite in the world), regular heinz salad cream and ranch. Overall, the spice level of the food wasn’t to my taste as I really enjoy spicy food. I requested pepper sauce on the side and it still wasn’t spicy! if you’re not really into pepper then you should be fine. My favorite items from the buffet were the gizzard and the Chinese noodles. My least favorite buffet item was the bread roll; it was like a stone! I don’t recall seeing any dessert options. Drinks: The one catch with the 2500 buffet is that it covers only food; drinks are charged separately. 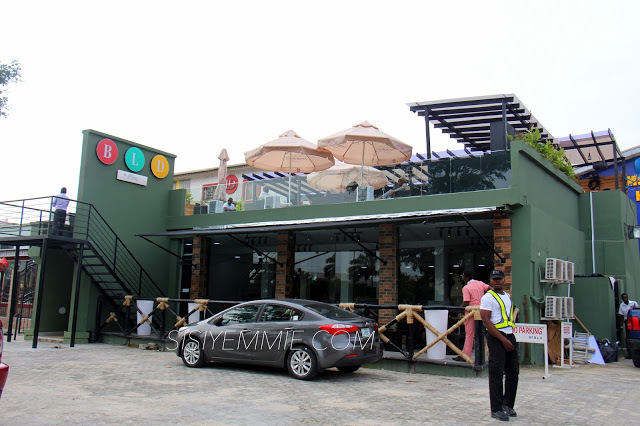 BLD cocktails are at least N2500. I got a Pina Colada which was sweet, but I couldn’t really taste the alcohol. I liked the presentation of the drink though…very fancy. Service: It didn’t take too long before I was seated and I appreciated that. 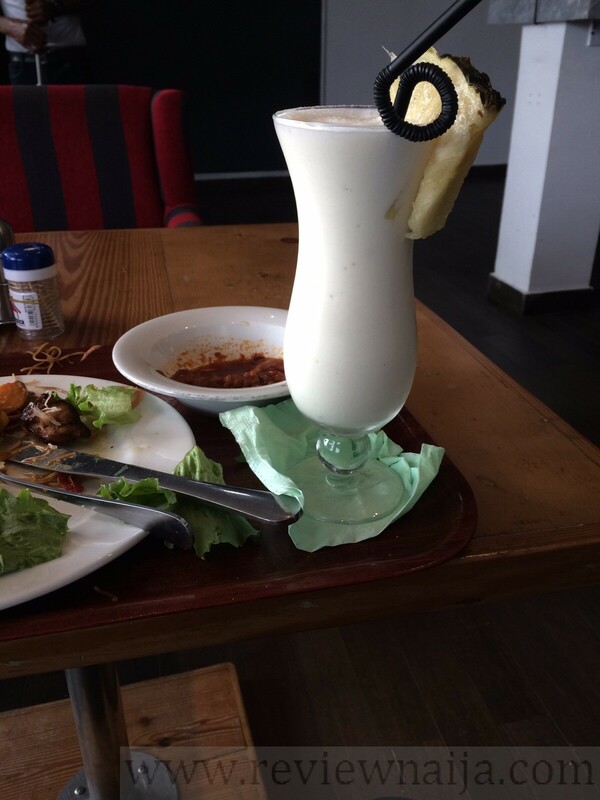 However, it took about 20 minutes for my Pina Colada to arrive and I’d almost finished my food by the time it came. POS was available but I opted to pay with cash. Unfortunately, there was no change. Verdict: Overall, a good experience. I give BLD an A for location and ambiance, and a B for food taste. I like the buffet price of N2500 and will definitely return for drinks. I’ve visited BLD at night and it can get really crowded. Parking becomes an issue so you’d have to park on the street (not safe because of oncoming traffic), the barber shop next door, or KFC. I’ve also tried the shisha and did not like it. It got ashy very quickly and didn’t last 15 minutes. Maybe they need a new shisha guy? Nice review! What flavor was the Shisha, and do they have a good variety of flavors? Best Shisha I’ve tried in Naij was at Pub1 in Ikeja..apple flavored. Very nice! !